Okay.. Time to boycott Nintendo. They have been an accomplice in the slaughter of innocent Tanooki's for too long. Just look at that plumber sleazeball all wrapped in the husk of a once noble creature. Save the whales! ..oh and that PETA made web video game linked below "Super Tanooki Skin 2D" is top tier, definite xmas gift material. The People for the Ethical Treatment of Animals might be barking up the wrong mushroom. On Monday, the controversial organization issued a press release attacking iconic Nintendo mascot Mario for wearing a 'Tanooki' suit in his latest adventure, the Nintendo 3DS game Super Mario 3D Land, which hit shelves on Sunday. 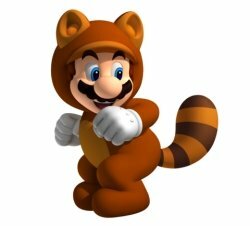 "Tanooki may be just a "suit" in Mario games, but by wearing the skin of an animal, Mario is sending the message that it's OK to wear fur," PETA says. The raccoon-like suit, which grants Mario the ability to glide across the screen, has been a part of the franchise since first appearing as a power-up in 1988's Super Mario Bros. 3. In the new game, Mario acquires the suit not by doing something lousy to a Tanooki, but by snagging a Super Leaf. Still, PETA insists this encourages animal abuse. "Tanukis are real-life raccoon dogs who are beaten and, as PETA's undercover exposés show, often skinned alive for their fur," says PETA Executive Vice President Tracy Reiman. "This winter, everyone can give raccoon dogs and other fabulous animals a 1-UP by keeping our wardrobes fur-free." It's just the latest in a long line of PETA game complaints. In 2008 they went after Cooking Mama for not being a vegetarian, while just last year they parodied challenging downloadable platform hit Super Meat Boy for starring a piece of raw meat. Nintendo has yet to comment, though we're pretty sure it will sound like a hand slapping a forehead. BTW took me 20+ tries to win that "Super Tanooki Skin 2D" game. lol. I at the Blood-stained Tanooki Suit Mario, personally. His bloodlust seems to know no bounds. Other than that, it just seems like a shameless attention-seeking ploy. They waited 21 years to release this statement? There's so many games out there where you can kill animals.. hit them with cars, skin them, eat them, make them explode into bloody showers. I dont get why they picked a mario game with cartoon graphics and basically no violence in it to make their point. Absolutely ridiculus, they made themselves look like fools +1.